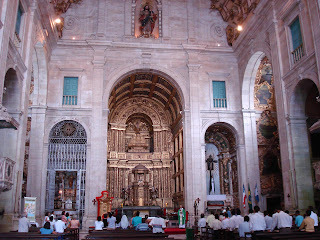 Next time I am in Brazil, I want to go to Salvador and visit the city’s Cathedral Basilica. 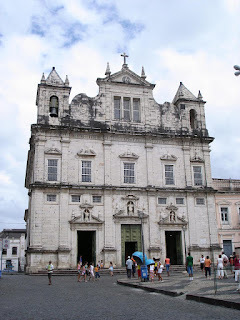 This cathedral was built between 1657 and 1672; originally, it was part of the Jesuit College in Salvador. All I can say is, those Jesuits sure know how to construct an awesome building. My two favorite things on the facade are the ginormous volute scrolls between the two bell towers. So awesome! I also love all of the broken (Baroque-en!) pediments that decorate the tops of the windows. The three statues that cover the portals are the saints Ignacio, Francisco de Borja and Francisco Xavier. 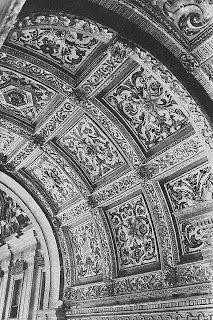 The nave ceiling with the Jesuit emblem. I love the gilded, elaborate carvings. Nave facing the shallow capela-mor and side altars. 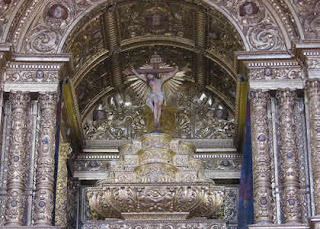 It is possible that the statue of Christ (above the main altar) is the largest wooden statue in Brazil. You can see a virtual tour of the Salvador cathedral here. 1 Candomblé is a religion-philosophy that is concentrated in Salvador. It has roots in African mysticism but also has been influenced by Catholicism (largely because African slaves were adopted/forced into the Catholic church by their owners). There are many similarities between the African deities and Catholic saints. Although I’m not a conservator or connoisseur, I knew from my art history background that craquelure is the pattern of fine cracks that occur in old paintings. What I didn’t know, however, is that there are different types of crack patterns. Craquelure can be further classified into French craquelure, Dutch craquelure, Flemish craquelure, and Italian craquelure. Check out this interesting study. I recently read George MacDonald’s novel Lilith, which caused me to think about the Jewish legend of Lilith, Adam’s first wife. Legend holds that Lilith was God’s first, unsuccessful attempt at creating a female companion for Adam. This dreadful attempt resulted in a female demon who attempts to corrupt the human race through lust. One of the best sources for the Lilith story is a medieval text called Alphabet of Ben-Sira (c. 10th century AD). According to this text, Lilith was made from the earth at the same time as Adam. Lilith was an independent woman. Since she and Adam were created the same way, Lilith refused to acknowledge Adam’s superiority (was she the first feminist? ha!). Eventually she left Eden to consort with demons that live in the Red Sea. When making a second female companion for Adam, God made Eve out of Adam’s rib so there would be no question of superiority.1 Some sources also refer to Lilith as a half-woman, half-serpent. Filled with jealousy for Eve, Lilith reportedly took on the form of a serpent in order to provoke the Fall of Man (as recorded in Genesis).2 You can read a little more about the Lilith legend and history here. The most interesting article I’ve read about Lilith is by Virginia Tuttle. She argues that Hieronymous Bosch’s Garden of Earthly Delights (1505-1510, left panel of altarpiece shown below) actually includes a depiction of Adam and Lilith, not Adam and Eve. I have always won dered why there are demonic beasts in the foreground of this Garden of Eden scene (it doesn’t seem too paradisaical, does it? Although, one can’t take Bosch too seriously; this whole altarpiece is a little absurd.). However, if one considers this woman to be Lilith instead of Eve, the presence of demonic beasts makes sense. Tuttle also convincingly argues that this left panel scene does not conform to the iconography of traditional Creation of Eve scenes. Traditionally, Adam is shown asleep or lying on his side, so that Eve easily can be created out of his rib. In other triptychs, Bosch follows this traditional iconographic format (see details in his Last Judgment triptych and Haywain triptych). However, in the Garden of Earthly Delights, Tuttle argues that it appears Lilith has been “raised up from the earth, as if she were created independently and immediately following Adam’s creation.”2 I think this is a convincing argument and I recommend that people read Tuttle’s article (it can be found in JSTOR). My only reservation about this argument is that it doesn’t seem to be widely accepted. This article was written almost twenty years ago, but recent art history texts continue to label this panel as Creation of Eve. Does anyone know of (or have) criticisms for this argument? 1 To read a synopsis Lilith story in the Alphabet of Ben-Sira, see Virginia Tuttle, “Lilith in Bosch’s ‘Garden of Earthly Delights,” Simiolus 15, no. 2 (1985): 123.-24. 2 Jeffrey M. Hoffeld, “Adam’s Two Wives,” The Metropolitan Museum of Art Bulletin, New Series 26, no. 10 (June 1968): 434. 3 For Medieval examples, see Ibid., 430-40. 4 Virginia M. Allen, “‘One Strangling Golden Hair': Dante Gabriel Rossetti’s Lady Lilith,” The Art Bulletin 66, no. 2 (June 1984): 286. Is It Really by Michelangelo? There has been some controversy and debate regarding a small wooden crucifix that has been attributed to Michelangelo. This crucifix made its public debut at the end of last year, and was recently bought by the Italian state for $4.2 million. 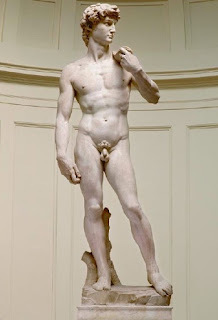 Like some experts mentioned in this recent article, I’m skeptical that this is an actual work by Michelangelo. Vasari’s biography doesn’t mention anything about the artist making small wooden statues. I’d be interested in learning more about the people who advised the Italian government to buy this piece. If this statue isn’t by Michelangelo, the Italian state has spent an unnecessary amount of money for this small, but pretty, statue. When I was in college, one of my professors explained her theory that art is cyclical in nature. Over the centuries, there are certain themes and styles in art that keep emerging and fading in popularity. I have often thought about this theory in regards to the Classical and Baroque styles. Although this theory can apply to different types of art, I am in the mood for looking at sculpture, so I’ll only mostly use sculptural examples. 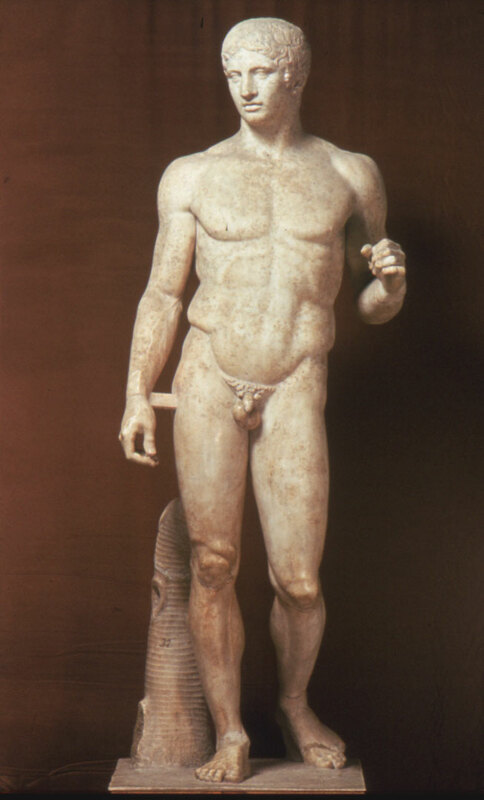 Polykleitos, “Spear-bearer” (Doryphoros), original dated c. 450-440 BC. Athena Battling Alkyoneos, Detail of the Gigantomachy Freize from the Altar of Zeus (Pergamon, Turkey, c. 175 BC). 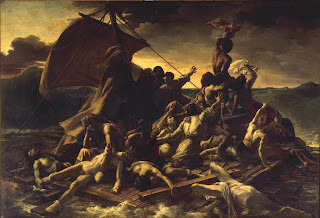 Since the Neoclassical/Romantic periods, the artistic continuum really hasn’t seen another revival of the serene/dramatic styles. There have been some slight interest in traditional subject matter, such as the Regionalism movement (think of American Gothic). I guess Regionalism could be considered a continuation of serenity and tradition, if one is willing to categorize abstractionism (the style the Regionalists rejected) as dramatic. Hmm. I’m curious to see if art will ever return back to this cycle. Since the 19th and 20th centuries, art has just exploded into different types of media and styles. Have we left traditional cycles altogether? It is interesting to think about what art will be like in a hundred years or so. What do you think about the future of art? Have you observed any other types of artistic cycles besides this one?